This mom, Adrea, was torn between two different Christmas card ideas, so she sent us an email to ask our opinion. We picked the Bold Foil Christmas Cards because we liked the way it fit with her family photo. (Her other choice was the Oh What Fun Holiday Photo Card with just their two children on the front.) What do you think? Did we make the right decision? Adrea thinks so. “You were so helpful with our decision. When you said you liked the family picture best, we went with it! The tipping point for me was knowing that our young children wouldn’t fit in our arms for many more Christmas card photos, so we took advantage of how sweet they looked in this picture! 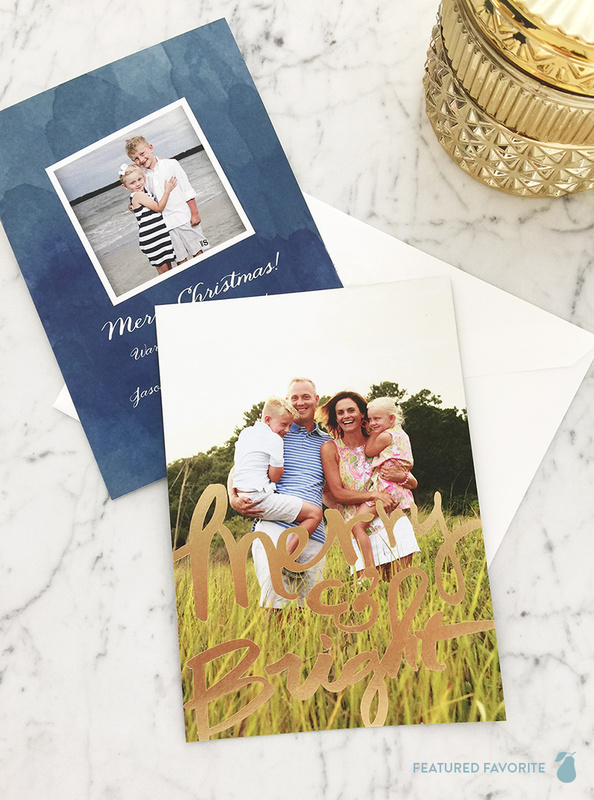 “While the Oh What Fun card was absolutely adorable, we were drawn to the gold foil Merry and Bright as fitting so perfectly with our family picture, taken in Pawley’s Island, South Carolina, over the summer. We were able to use the picture of our two babes that we loved so much on the back of the Merry and Bright card, with the blue card complementing the ocean.” We agree. Good choice!